When it comes to recording video, elements like composition, lighting, audio recording, judicious use of camera angles, panning, zooming, and so on all require practice and a certain degree of artistic sensibility; these do not come in the box with your smartphone, DSLR, or camcorder. And although virtually every modern video recording device for consumers has a built-in mechanism to compensate for the jitter caused by small hand movements, long handheld shots—especially those taken while walking, as is natural for camcorder users—typically include a fair amount of bounce and sway, making them look amateurish regardless of any other merits the recording may have. You almost never see such bumpy images on TV or in movies, unless a shot was made that way intentionally to achieve a certain effect. Professional videographers and cinematographers supplement their skill with a great piece of technology called a steadicam to smooth out the trickiest of handheld shots. You can think of the steadicam as an extremely sophisticated shock absorber for a camera. Just as the shock absorbers on your car keep the ride smooth even when the road is not, so a steadicam keeps a camera steady despite bumps underneath. But unlike automotive shock absorbers, a steadicam must also compensate for pan (horizontal rotation), tilt (rotation up or down), and roll (rotation about the axis of the lens)—but only when these changes are not explicitly implemented by the operator. After all, a handheld shot that could only ever point in one direction would not be terribly interesting. To do all this, a steadicam starts with a large, rigid harness or vest worn by the operator. Because the entire apparatus, including the camera, is typically quite heavy—sometimes as much as 90 lb. (about 40kg)—the vest spreads out the weight as much as possible. This not only minimizes fatigue, but also gives the camera a much more solid attachment point than the operator’s arms would provide. Protruding from this vest is a heavy-duty mechanical arm, somewhat reminiscent of the ones used in certain adjustable desk lamps. The arm has two rigid segments (called “bones”), connected by spring-loaded joints. The mechanism is designed in such a way that the bones always remain parallel to each other, but can move up, down, left, and right with the application of a small force from the operator. The camera itself (whether film or video) sits atop a postlike mounting assembly called a “sled,” which is attached to the end of the arm by a free-floating rotating joint known as a gimbal. The weight of the camera is counterbalanced partly by the tension of the springs and partly by other components mounted at the bottom of the sled such as batteries and a video screen that enables the operator to see what is being filmed while watching their step. All these joints, springs, and weights shift the center of gravity away from the camera itself while providing multiple points where vibration and other unwanted movement can be isolated from the camera. The net effect is that the operator can walk, climb stairs, step over obstacles, or even jog while keeping the “floating” camera perfectly smooth. This makes possible shots that could never be achieved with a tripod or dolly, enabling the camera operator to walk among the actors freely while keeping all equipment out of the shot. The steadicam was invented in 1973 by cinematographer Garrett Brown, with its mainstream debut in the 1976 film Rocky. Since then, it has become ubiquitous in both film and TV. The most impressive use of the steadicam I’ve seen is the 2002 film Russian Ark, shot in the Hermitage, a former palace in St. Petersburg that’s now a museum. The entire 90-minute film was done as a single, continuous steadicam shot that followed the main character as he walked from one room to the next. Garrett Brown himself also famously used a steadicam to capture footage of California’s Redwood National Park in slow motion as he walked through it; when the footage was played at regular speed, it produced the backdrop for the speeder bike sequence in Return of the Jedi (1983). As sophisticated as steadicams are, they are useless without a highly trained operator. A great deal of practice, not to mention stamina, is necessary to become proficient filming scenes with a 90-pound weight hanging from your chest. 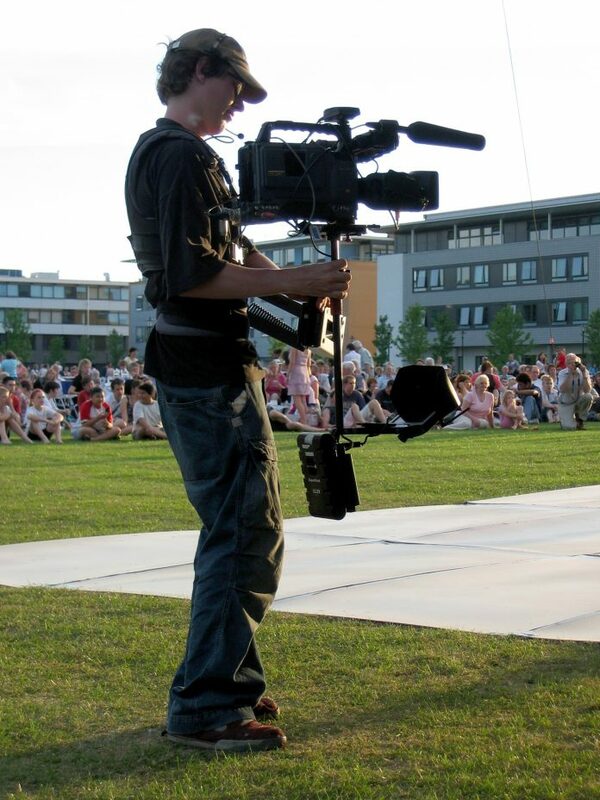 Steadicam operators, who generally work as freelancers and provide their own equipment, are both highly paid and well respected. Professional steadicam equipment is, not surprisingly, quite expensive (a complete rig can cost as much as a mid-range car)—though scaled-down versions for use with smaller consumer devices can be had for well under US$1,000. That money won’t make your vacation videos less boring, but your camera’s “off” switch was designed for just such a purpose. Note: This is an updated version of an article that originally appeared on Interesting Thing of the Day on November 11, 2004.